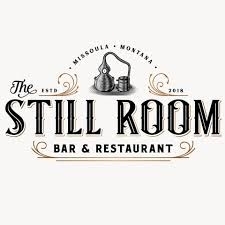 The Broadway Bar and Grill is now The Still Room. With 13 HD TVs playing your favorite sports, a pool table, outdoor patio and bar, pool, hot tub, and darts - we offer something for everyone. We carry the NHL and NFL packages, as well as all college sports and any nationally televised MLB and NBA. We are concentrated on and committed to bringing Missoula the highest quality cocktails, beer and food using locally sourced food, pressing our juices in house while using the finest liqueurs and vermouths, and carrying a large assortment of craft and locally made beer and spirits. Our food menu uses exclusively locally sourced meat from Oxbow Cattle Co, Montrail Elk, lamb from Western Montana Grower's Co-op, bison from Bitterroot Bison, and eggs from Spencer's Family Farms. Our burger buns and delicious desserts are also sourced from Bernice's bakery right down the street.